There is absolutely nothing that can warm the cockles of a speaker’s heart — whatever cockles are and why you might find them in a heart — than an audience full of questions. And that’s why this great big THANK YOU is going out to the genealogists of Cleveland, for a truly wonderful weekend. 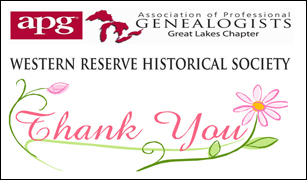 First, it was standing room only Friday night at the Great Lake Chapter of the Association of Professional Genealogists for The ABCs of DNA. Understanding how the three big DNA tests can be used for genealogy can be a challenge, and the questions folks had were really focused. Then yesterday, the Genealogical Committee of the Western Reserve Historical Society hosted an all-day affair called Genealogy and The Law, and it was truly wonderful. The facility is stunning: a gorgeous museum and library that is a family historian’s dream. If the library’s books and manuscripts and microfilm and newspapers and-and-and aren’t enough to pull you in, the museum exhibits of antique cars and planes and even a calliope ought to do it. And the room full of people — oh my. Four presentations — How Knowing The Law Makes Us Better Genealogists, Using Court Records To Tell the Stories of Our Ancestors’ Lives, Dowered and Bound Out: Widows and Orphans Under The Law, and Through the Golden Door: Immigration after the Civil War — and four wonderful sets of questions from top-notch folks expanding on the whole topic for everyone’s benefit. A great day, a great venue, great questions and great people. I wish I had been there. Great topics and it sounds like 4 chapters of a very interesting book. Thanks for the kind words, Ann! It was a wonderful weekend! Thank YOU for the fantastic presentations, Judy! I couldn’t even begin to pick a favorite–they were all packed with information that I can apply directly to my research. And I agree, the facility and fellowship were top notch. You truly made learning a pleasure! Shelley, you’re so kind to say so! Thanks! I had a great time! Thank you for the wonderful presentations! You expanded my understanding of how the law affected my ancestors. It was a great day of learning! Thank you! Thanks so much for the kind words, Julie! Thank you, Judy, for five information-packed lectures. As a sometimes presenter, I appreciated your approach of covering an outline of pertinent material in each lecture, and using brief case studies to illustrate various key points. How deeply you dug for some of the facts in the case studies was an inspiration to me. Your sense of humor was great too. Thanks so much, Wally! I sure appreciate the kind words. You opened up all new avenues of research possibilities for me. I expected a fruitful, informative day, but your presentations exceeded any expectations I had formed. Your use of examples that ran the gamut of humorous, poignant to heart wrenching, truly put the effects of the law in perspective. I am the person interested in the records for the Philadelphia Orphan Home 1820. I explored the familysearch card catalog, but alas, I was unsuccessfully in finding that particular listing. Any assistance from you on the catalog number would be greatly appreciated. Linda, thank you so very much for those very kind words. I’m so glad you found the presentations useful. The records I used from Philadelphia were on FHL film 972941. There are several other related films (972942-45, 974676, and 2148901-02) and you can probably find them all by doing a keyword search for Philadelphia Children’s Asylum. Sure hope this helps! Thank you for following up, I will order the film. You’re most welcome, and good luck with your research! Judy, congratulations! I think you were in your glory in these sessions. And four presentations! My, oh, my. So well deserved! Thanks for those kind words, Mariann. I had an absolute ball for all of the presentations! Outstanding! hanks for sharing that!